Market Hodgepodge Salad with artisanal ricotta, lemon verbena oil, fresh herbs, and spring market vegetables Bouchaine Vineyards 2008 Estate Chardonnay & Bouchaine Bacchus Collection 2009 Rose of Syrah. House Smoked Trout with sweet potato pancakes, creme fraiche, and baby butter lettuce salad Bouchaine Vineyards 2007 Carneros Pinot Noir In the pre-brunch tasting I praise this wine’s “true pinot aromas” and “balance,’ then note how it nicely brought out the light smokiness of the trout. Housemade Maple & Sage Sausage with fried egg, creamy grits, spinach, and toasted pecans So here’s where things get murky. I did not record the wine pairing although I strongly suspect it was the Bouchaine Bacchus Collection 2008 Rockin’ H Vineyard Syrah A “nice mid-range syrah, not too heavy or oaky” my notes tell me. Blintzes with Housemade Farmers Cheese and strawberries, balsamic, and fresh basil Bouchaine Vineyards 2008 Bouche d’Or The blintzes and this late-harvest chardonnay-based dessert wine constituted my favorite pairing of the day. I call it “a perfect match” and note how the balsamic and basil flavors did not compete with the honey and ripe-fig notes of the wine. In a different previous post I mentioned that I was scheduled to attend a cooking demo and presentation at Miele Princeton by Maria Speck, the author of the above cookbook. Both the book (currently nominated for the Julia Child Award) and Ms. Speck exceeded my already high expectations. Before you click to read all about it in my latest In the Kitchen column in The Princeton Packet (including recipes), here are some photos from the session and just a few of the many excellent tips for working with grains that she passed along during her presentation, which I didn’t have space in my column to share. In the foreground is Lemon Quinoa with Currants, Dill, & Zucchini, the recipe for which is reprinted in my column. 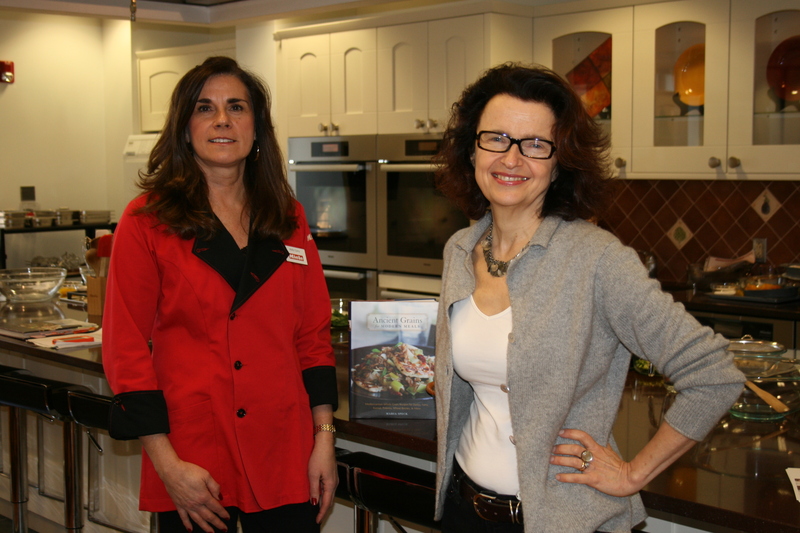 Holly Curry of Miele (left) and Maria Speck. Two Miele culinary professionals, Curry and Mary Mould, made the day’s dishes using the Miele Steam Oven. 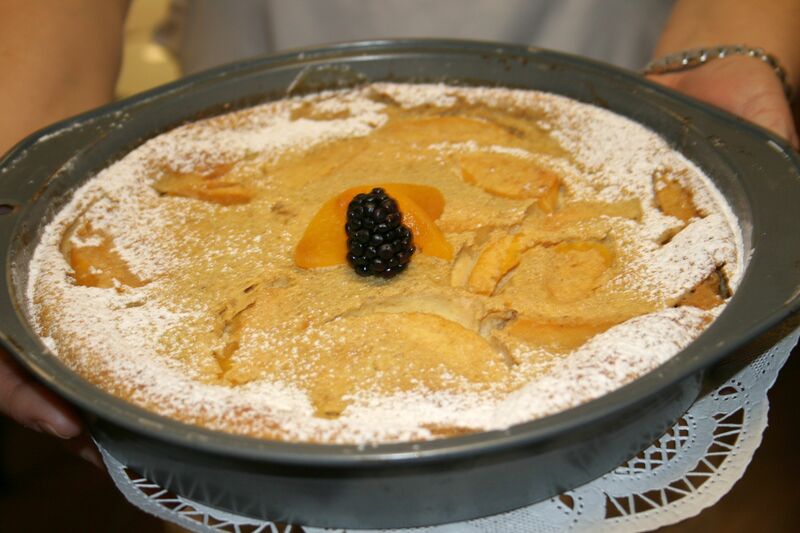 Ms. Speck’s Almond-Peach Clafouti – the only recipe that day that was cooked in a conventional oven. *She experimented and found no difference whether you rinse whole grains or not before cooking. She thinks today’s grains are much cleaner than they used to be. *She likes to add fresh herbs both at the beginning of the cooking process and again at the end. *For baking, she recommends weighing ingredients on a kitchen scale rather than relying on traditional dry and wet measures of cups, teaspoons, etc. Kitchen humidity makes a big difference, especially in flour for bread baking where, she says, humidity affects the measurement by up to 25 percent. And can result in a too heavy loaf. *She particularly likes the grain kamut because it is truly ancient. Unlike other grains, it has never been hybridized. And lastly, a reminder: There’s still time to win a copy of the 2011/12 NJ Zagat Restaurant Guide. See my prior post for details. 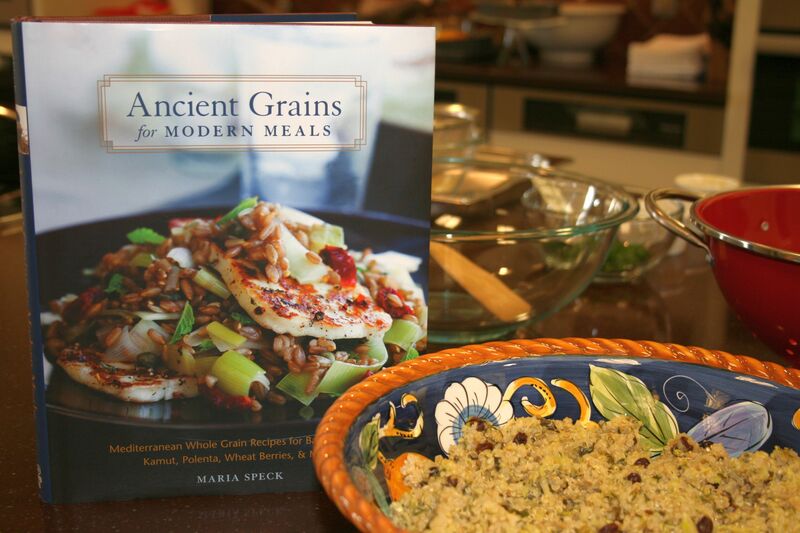 Here again is the link to my Packet story on Ancient Grains. This entry was posted in Favorite Finds, Interviews, Recipes, Restaurants and tagged almond peach clafouti, Ancient Grains for Modern Meals, Back Forty, Back Forty West, Bouchaine Vineyards, Holly Curry, lemon quinoa, Maria Speck, Mary Mould, Miele Princeton. Bookmark the permalink. Now you’ve made my mouth water, Pat!